Wild Boar is well known for having the best radiator relocation kits. Our Can-Am Maverick 800/1000 (All Years) radiator relocation kits are made of steel to hold up to the roughest riders and harshest conditions. The Can-Am Mavericks are one of the more luxurious machines on the market. We took pride in designing a radiator relocation kit to fit the toughness and great appearance of these amazing rides. They’re powder coated black wrinkle for extra durability and to give your machine a great look. These kits come with everything you will need to relocate the radiator. You will receive additional hose, mounting brackets, all the hardware you will need, and user-friendly installation instructions. Bonus! 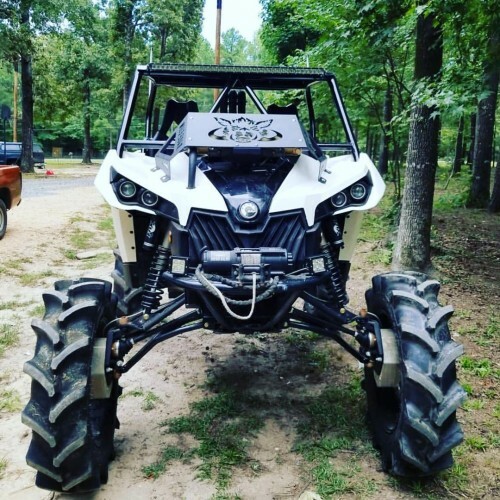 With our Can-Am Maverick radiator relocation kit, you can still take the hood off without removing the rad kit AND it doesn’t block your view while you’re driving! Are you ready to purchase your new radiator relocation kit and wondering what else would be make your Maverick a beast in mud? Check out our radiator relocation/ snorkel kit combo AND our matching Maverick Front Bumper with Lights!